For the second annual event, Fiore Tedesco (Loca d’Oro) led a team of exciting chefs including Michael Fojtasek (Olamaie), Fermin Nunez (formerly of Launderette and La Condesa), Derek Flynn (Swift’s Attic & Wu Chow), creating dishes with Fusebox artists from all over the globe. Mixologist Bryan Floyd (Sourced Craft Cocktails & Weather Up) covered the craft cocktails. The Event Planner that orchestrated the night was Richelle Ouellette, while McCray & Co and Clay Imports were responsible for the event design. This was truly a one-of-a-kind event for food-lovers, art-lovers, and lovers in general. CONVERSATION Creating new avenues of conversation. INNOVATION Presenting contemporary works and programs that challenge, re-invent and push us forward. EDUCATION Furthering our understanding of the contemporary arts through a series of dynamic panel discussions, brunches, informal chats, writings, interviews and intensive workshops led by master instructors. ARTIST SUPPORT Providing resources, equipment, and money for the creation of new works and improved sustainability/quality of life for artists. COLLABORATION Establishing new creative partnerships between artists, organizations, and business. As design-lovers, we were more than happy to participate in an event dedicated to celebrating creatives. 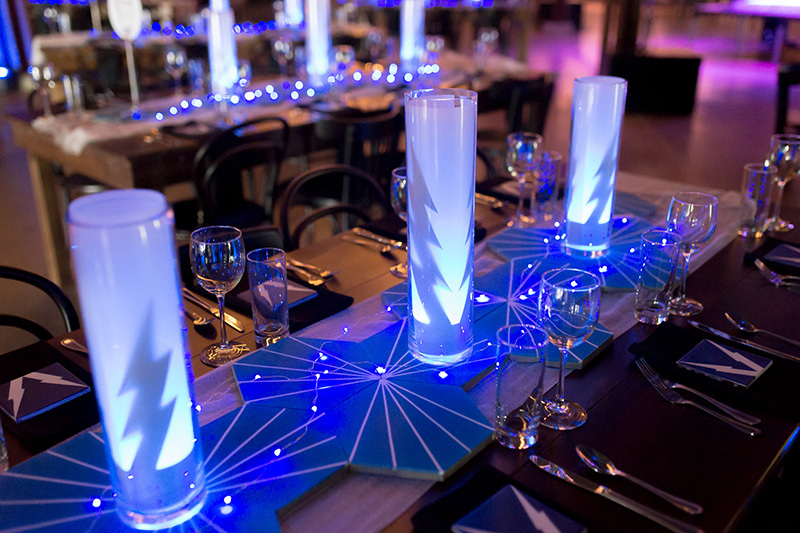 Guests dined and lounged on Party at the Moontower Event Rentals, as seen below! HighDot Studios photographed this unique set up.